Wives and girlfriends of superheroes aren’t as hard-done-by as parents of superheros, but they’re a close second. Not only do they inevitably have a rough time, but everybody (including fans) hate them—which is no surprise. Each superhero girlfriend has a large number of factors working against her. This is primarily a problem in the TV shows and films. Two attractive leads are supposed to express the burning desire and unspoken compatibility between the characters when the show itself hasn’t yet established their dynamic. All anyone knows is that they have to be together, and so two people are pushed into scene after scene of emotional intimacy involving terrible revelations, meaningful looks, and declarations of each other’s greatness without even establishing a baseline for their relationship. 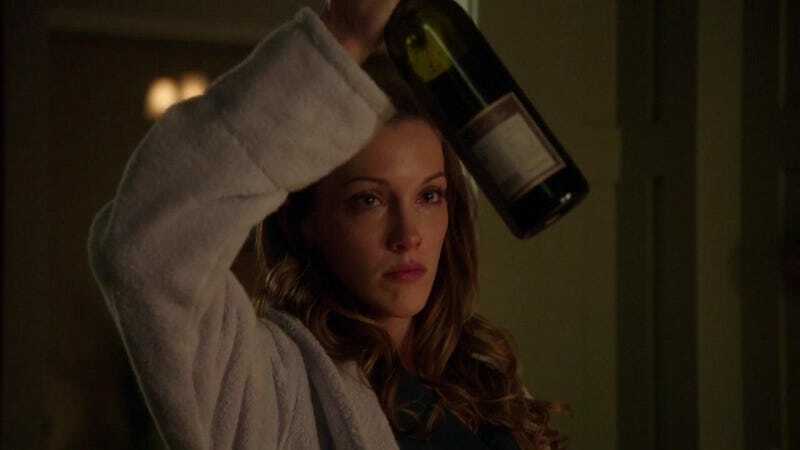 This is why, for example, Oliver Queen in Arrow had such bad chemistry with Laurel Lance that he was more romantically compatible with every other female character on the show, including his mother. In comics, girlfriends have things a little easier—but only because comic book characters have about seventy-five years of story behind them and the girlfriends who didn’t work always left with the next story arc. On the flip side, when a superhero girlfriend dynamic goes wrong in comics, it sticks until the end of time. See Carol Ferris, who has nothing in common with Hal Jordan except heterosexuality, and Betty Ross, who has spent the last fifty-four years miserably breaking up with the Hulk. Superheroes include elements from adventure stories, detective stories, and science fiction—but when it comes to the relationships they’ve always been melodramas. Melodramas can’t miss any opportunity for a big revelation, which is why the girl never knows that her love interest is a hero at the start of the series. He will hide his activities from her, and keep lying to her in order to cover any slips or discrepancies. Meanwhile, the beginning of a series will always involve a hero building a team. To do this he will find people with special abilities or commitments, take them into his confidence, and work with them towards common goals while building a rapport. You’ll notice that the latter pattern of behavior is a great way to show people falling in love while the former is a terrible one. So while the rest of the characters are refining their relationships, honing their skills, and coming to understand each other as people, the girlfriend or potential girlfriend is wandering around in a state of perpetual ignorance, having no chance to attach herself to any other character. Much of the stuff that superheroes have to do—rushing off without explanation, showing up late for a casual meeting, distancing themselves from a person close to them, and suddenly changing personality due to a poison, spell, or encounter with red kryptonite—will make them seem like real jerks if they can’t offer an explanation. This is bad enough. What’s worse is the fact that the hero wants to avoid these behaviors every bit as much as the girl wants him to avoid them. He wants to offer an explanation just as much as she wants to hear it. Roughly one third of the time, he only falls into these situations because he’s rescuing the very girl who inevitably gets mad at him. Intellectually, we viewers know that she’s responding reasonably. But viscerally, this conceit is like trying to get a child to like vegetables by shocking them with a cattle prod every time they pick up a carrot. However great a girlfriend might be in reality, viewers learn to associate her only with pain. Let’s say a girlfriend finally works her way through the misunderstandings and the bad timing and the fact that he had to arrest her father, the ice wizard, and she was once nearly seduced by his evil secret twin. Etc. etc. What’s next for the happy couple? Nine out of ten times, it’s more problems with the ice wizard and the evil secret twin. This, again, comes back to the fact that superhero stories are melodramas, and melodramas eat stable relationships slowly and from the inside like a parasitic wasp. It takes infinite skill to make a superhero’s relationship any more than just an infinite cycle of cry-n-fight, fight-n-cry. It’s a shame, because we know long-term partnerships can work—we see them when it comes to the friends and allies of the superheroes. Two superhero friends can go through eight seasons and only get more comfortable and familiar with each other, but when you’re a girlfriend, every bump in the road is disaster. Us regular folks have people who we love. What we don’t have is the kind of creepy-intense love on display all the time in superhero stories. Superheroes gaze up at a window for hours while their loved one works on a laptop, or lurk in the shadows above a doorway, grimly overhearing conversations, or lose control and beat anyone who so much as looks funny at her to a pulp. This is fine, actually. No one watches television to see people handle their problems in a low-key, healthy way. Fiction is the place for over-intense relationships. The problem is, when the hero is so focused on only one person, there’s only one person who can be threatened in the final, climactic confrontation. Everyone gets an occasional near-death experience during a superhero’s run, but it’s always the girlfriend who requires the most sacrifice. One would think that all that adoration and those high stakes would make the girlfriend a permanent fixture in a series. As it turns out, no. In some ways, this is a good thing. Every fictional series has to have some way to jettison an aspect of the story that simply will not work. From Mary Watson (only in the books, don’t worry) to Gwen Stacy, the girlfriend eventually gets eliminated. That’s because the girlfriend isn’t the point—the adoration itself is the point. Something has to get the hero ready to fight and something has to drive his public life, and it might as well be the woman he loves. If she dies or moves away, it’s sad—but there can always be another woman he loves. Give him a year or two, and he’ll be saying, “I never thought I could feel this way again” to yet another totally disposable true love. This list of supporting characters for nearly every superhero includes the following people: the tough one, the funny one, the tech wizard, the prissy one, the wild one, and the love interest. Of the lot, you’ll notice that the love interest is the only one with no character traits whatsoever. That could be freeing. The love interest could be anybody—a crazily ambitious business woman, a weirdo artist, a slacker who uses her free time wander around the neighborhood at night superhero-spotting for her own amusement, an uptight gossip, a flamboyant opera singer, a slightly depressive stay-at-home-mom. Instead, she’s everybody and nobody. This is the defect that female love interests most often share with male love interests—although male love interests at least sometimes fall into the “brooding man-of-mystery” category. A female love interest has sort of a goodish job and is sort of a goodish person. She may complain about money, but her apartment is decent and she dresses well, though never flamboyantly. She’s fairly smart, pretty organized, and, in order to get her into all kinds of trouble involving the villain of the day, she’s “plucky.” She’s grindingly fine, relentlessly okay. She’s the word “meh” in human form. Perhaps, at the end of the day, that’s why audiences dislike her. We sense, no matter what we’re told over and over again in the story, that she has too weak a character for anyone to ever actually love her.